原文：I am a son of Earth and starry sky. I am parched with thirst and am dying; but quickly grant me cold water from the Lake of Memory to drink. 原文：Now you have died and now you have come into being, O thrice happy one, on this same day. Tell Persephone that the Bacchic One himself released you. 原文：Aristotle says the poet Orpheus never existed; the Pythagoreans ascribe this Orphic poem to a certain Cercon. 原文：The Orphics were an ascetic sect; wine, to them, was only a symbol, as, later, in the Christian sacrament. The intoxication that they sought was that of "enthusiasm", of union with the god. They believed themselves, in this way, to acquire mystic knowledge not obtainable by ordinary means. This mystical element entered into Greek philosophy with Pythagoras, who was a reformer of Orphism as Orpheus was a reformer of the religion of Dionysus. From Pythagoras Orphic elements entered into the philosophy of Plato, and from Plato into most later philosophy that was in any degree religious. 原文：He is not an orthodox Orphic; it is only the fundamental doctrines that he accepts, not the superstitions and ceremonies of purification. ^ History of Humanity: From the seventh century B.C.E. to the seventh century C.E. Routledge reference, Siegfried J. de Laet, UNESCO, 1996,ISBN 92-3-102812-X, pp. 182-183. ^ Apollodorus (Pseudo-Apollodorus), Library and Epitome, 1.3.2. "Orpheus also invented the mysteries of Dionysus, and having been torn in pieces by the Maenads he is buried in Pieria." ^ Backgrounds of Early Christianity by Everett Ferguson,2003,page 162,"Orphism began in the sixth century BCE"
^ Parker, "Early Orphism", pp. 484, 487. ^ The Derveni Papyrus: An Interdisciplinary Research Project. Harvard University, Center for Hellenic Studies. ^ Aristotle; Ross, W. D. (William David), 1877; Smith, J. A. (John Alexander), 1863-1939 (1908). The works of Aristotle. p. 80. ^ Bertrand Russel (1947). History of Western Philosophy. George Allen and Unwin. p. 37. ^ Bertrand Russel (1947). History of Western Philosophy. George Allen and Unwin. p. 111. Alderink, Larry J. Creation and Salvation in Ancient Orphism. University Park: American Philological Association, 1981. Athanassakis, Apostolos N.（英语：Apostolos Athanassakis） Orphic Hymns: Text, Translation, and Notes. Missoula: Society of Biblical Literature, 1977. Baird, William. History of New Testament Research. Vol. 2. 2002, 393. Bernabé, Alberto and Ana Isabel Jiménez San Cristóbal. 2008. Instructions for the Netherworld: the Orphic Gold Tablets. Boston: Brill. Betegh, Gábor. 2006. The Derveni Papyrus. Cosmology, Theology and Interpretation. Cambridge. Bikerman, E. “The Orphic Blessing.” Journal of the Warburg and Courtauld Institutes 2 (1938–39): 368-74. Bremmer, Jan. “Orphism, Pythagoras, and the Rise of the Immortal Soul.” The Rise and Fall of the Afterlife: The 1995 Read-Tuckwell Lectures at the University of Bristol. New York: Routledge, 2002. 11-26. Bremmer, Jan. “Rationalization and Disenchantment in Ancient Greece: Max Weber among the Pythagoreans and Orphics?” From Myth to Reason: Studies in the Development of Greek Thought. Ed. Richard Buxton. Oxford: Oxford University Press, 1999. 71-83. Brisson Luc. “Orphée et l'orphisme dans l'antiquité gréco-romaine.” Aldershot : Variorum, 1995, env. 200 p. (pagination multiple), ISBN 0-86078-453-3. Burkert, Walter（英语：Walter Burkert）. 2004. Babylon, Memphis, Persepolis: Eastern Contexts of Greek Culture. Cambridge, MA. Burkert, Walter（英语：Walter Burkert）. “Craft Versus Sect: The Problem of Orphics and Pythagoreans.” Jewish and Christian Self-Definition: Volume Three - Self-Definition in the Greco-Roman World. Ed. B. Meyer and E. P. Sanders. Philadelphia: Fortress, 1982. Comparetti, Domenico（英语：Domenico Comparetti）, and Cecil Smith. 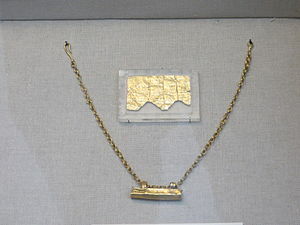 “The Petelia Gold Tablet.” The Journal of Hellenic Studies 3 (1882): 111-18. Dungan, David, and David Laird Dungan. A History of the Synoptic Problem: The Canon, the Text, the Composition, and the Interpretation of the Gospels (The Anchor Bible Reference Library). 1999, 54-55. Edmonds, Radcliffe. Myths of the Underworld Journey: Plato, Aristophanes, and the 'Orphic' Gold Tablets. New York: Cambridge University Press, 2004. Finkelberg, Aryeh. “On the Unity of Orphic and Milesian Thought.” The Harvard Theological Review 79 (1986): 321-35. Graf, Fritz. 1974. Eleusis und die orphische Dichtung Athens. Berlin, New York. Graf, Fritz. “Dionysian and Orphic Eschatology: New Texts and Old Questions.” Masks of Dionysus. Ed. T. Carpenter and C. Faraone. Ithaca: Cornell UP, 1993. 239-58. Graf, Fritz, and Sarah Iles Johnston. 2007. Ritual texts for the Afterlife: Orpheus and the Bacchic Gold Tablets. Routledge: London, New York. Guthrie, W. K. C.（英语：W. K. C. Guthrie） 1935, revised 1952. 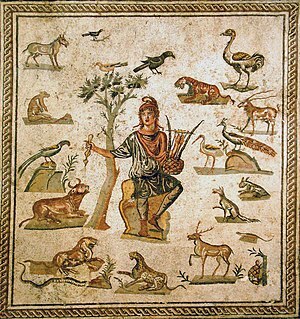 Orpheus and Greek Religion: A Study of the Orphic Movement. London. Harrison, Jane Ellen（英语：Jane Ellen Harrison）. Prolegomena to the Study of Greek Religion. Cambridge: Cambridge University Press, 1903. Kern, Otto（英语：Otto Kern）. Orphicorum fragmenta, Berolini apud Weidmannos, 1922. Martin, Luther H. Hellenistic Religions: An Introduction 1987, 102. Nilsson, Martin. “Early Orphism and Kindred Religious Movements.” The Harvard Theological Review 28.3 (1935): 181-230. Parker, Robert. “Early Orphism.” The Greek World. Ed. Anton Powell. New York: Routledge, 1995. 483-510. Robertson, Noel. “Orphic Mysteries and Dionysiac Ritual.” Greek Mysteries: the Archaeology and Ritual of Ancient Greek Secret Cults. Ed. Michael B. Cosmopoulos. New York: Routledge, 2004. 218-40. Sournia Alain. Chap. "Sagesse orientale et philosophie occidentale : la période axiale" in Fondements d'une philosophie sauvage. Connaissances et savoirs, 2012, 300 p., ISBN 978-2-7539-0187-2. Tierney, M. “The Origins of Orphism.” The Irish Theological Quarterly 17 (1922): 112-27. West, Martin L.（英语：Martin Litchfield West） “Graeco-Oriental Orphism in the 3rd cent. BC.” Assimilation et résistence à la culture Gréco-romaine dans le monde ancient: Travaux du VIe Congrès International d'Études Classiques. Ed. D. M. Pippidi. Paris: Belles Lettres, 1976. 221-26. West, Martin L.（英语：Martin Litchfield West） 1983. Orphic Poems. Oxford. Zuntz, Günther（英语：Günther Zuntz）. Persephone: Three Essays on Religion and Thought in Magna Graecia. Oxford: Clarendon Press, 1971. Reale, Giovanni. História da Filosofia Antiga Vol. I Edições Loyola, São Paulo, 1990.